I currently work at Kalani Oceanside Retreat Center on the Big Island of Hawaii. I offer Aquatic bodywork based on Healing Dance and add bodywork and/or Cranial when called for. I am a Somatic Experiencing Practitioner and offer combination sessions of SE and aquatic bodywork. I have been an aquatic bodyworker since 1996, working at Harbin Hot Springs as a Watsu®, WaterDance® and Healing Dance® practitioner. My classes are informed by my extensive work with clients from all walks of life. I am passionate about Aquatic Bodywork and bring that passion to my teaching. My knowledge of movement comes from yoga, tai chi, and dance and my knowledge of the water comes from swimming and playing with dolphins. My teaching style is very much like an aquatic bodywork session, easy and graceful in a flowing environment. 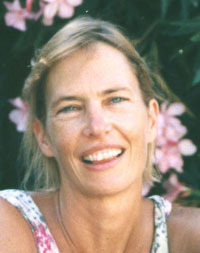 I teach Watsu® I & II, Healing Dance® I & II, and the underwater Healing Dance courses: Above & Below and Shape & Space. I also teach Healing Dance 100 (Aquatic Basics and Healing Dance Essentials) for spa and clinic environments. I spent 2 years as director of Harbin School of Healing Arts before it burned. I have since moved to the Big Island of Hawaii, working and teaching at Kalani Oceanside Retreat Center. 10735 total hours ...Includes hours of 173 WABA water classes taught.